First-half strikes from Ryan Jack, Jermain Defoe, Scott Arfield and a James Tavernier penalty had the Light Blues cruising before substitute Kyle Lafferty added some late gloss to the scoreline with three minutes left to play to follow up the midweek hammering of Kilmarnock at Ibrox Stadium. 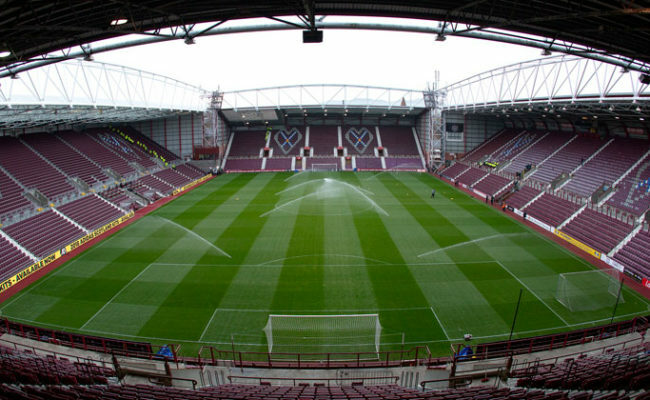 From the side which defeated Kilmarnock so emphatically in the Scottish Cup in midweek, out went Borna Barisic and Alfredo Morelos, who served the third and final game of his suspension, with their places taken by Andy Halliday and Jermain Defoe, while Allan McGregor returned from his ban in place of Wes Foderingham. After surviving a George Oakley effort in the opening seconds, Gers soon took control of the match, playing some lovely football while starting to create some decent openings. Good work from Ryan Kent set up Scott Arfield for a 20-yard effort which was held by ‘keeper Gary Woods before a last-ditch intervention from Aaron McGowan prevented Connor Goldson powering home a header from a Daniel Candeias cross. Then, a huge chance came the way of Gerrard’s side. A mix-up in the Accies midfield with the defence pushed forward allowed Ryan Jack to charge towards goal. He noticed the run of Jermain Defoe to his right, but his shot from just inside the area was charged down by the onrushing Woods to deny the former England striker. Gers were playing some exceptional football, however, and it seemed only matter of time before the opening goal arrived. And indeed it did, thanks to a wonder strike from Ryan Jack for his third of the season. Picking up the ball fully 25-yards from goal on the right hand side, he curled a beautiful effort into the bottom opposing corner to give the visitors a thoroughly deserved lead on 16 minutes. And within a minute, 1-0 became 2-0! A lightning break from Gers after Accies cheaply conceded the ball from the restart ended with a quite wonderful cross from Daniel Candeias to pick-out Defoe at the back-post, making that typical movement to peel away from the last defender, before bulleting a header into the net. This was superb stuff from Gerrard’s side, and things got even better on 24 minutes, with yet another beautiful goal. Pressing to win the ball high up the park, Andy Halliday claimed a turnover and squared for Arfield who was situated on the 18-yard line. With the outside of his right boot, he curled a sensational effort into the top corner, well out the reach of Woods to surely kill the game with just over a quarter of it played. Ryan Kent had a go at making it four with sensational skill to take him through the midfield and towards goal though his final effort was over the bar. Kent then won Gers the chance to make it 4-0 on 43 minutes after being felled by Ziggy Gordon inside the area. 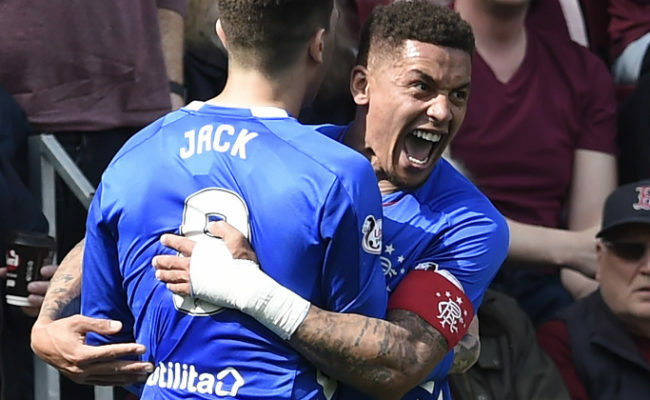 Up-stepped James Tavernier to take, and he overcame his recent spot-kick heartache to blast the ball beyond Woods, despite him guessing correctly to his left-hand side. 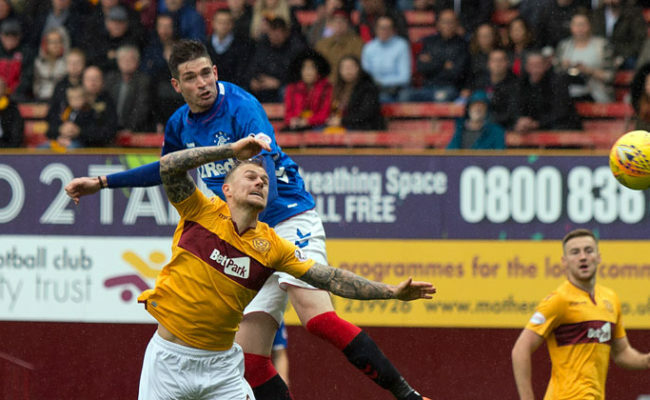 Gers should have very quickly made it five at the start of the second half with yet another lovely move. A sublime flick on halfway from Candeias set Arfield clear, with Arfield squaring the ball back for the Portuguese on the edge of the area. His effort, on the half-volley, however, was over the bar, before minutes later, Defoe was denied on the edge of the area by Woods again after being released clear by Arfield. Gerrard replaced Arfield and Kent with Steven Davis and Kyle Lafferty on the hour mark, and Lafferty almost had an instant impact, setting up Defoe to test Woods at is near post with a powerful effort. Lafferty was then denied a headed goal from a Candeias cross from another super McGowan block at the last possible moment, but the big Ulsterman wasn’t to be denied. With three minutes left to play, Daniel Candeias grabbed his fifth assist in two games with a break down the right and a cutback for Lafferty to stroke home the final goal of a superb afternoon for Gers from around 12-yards out. 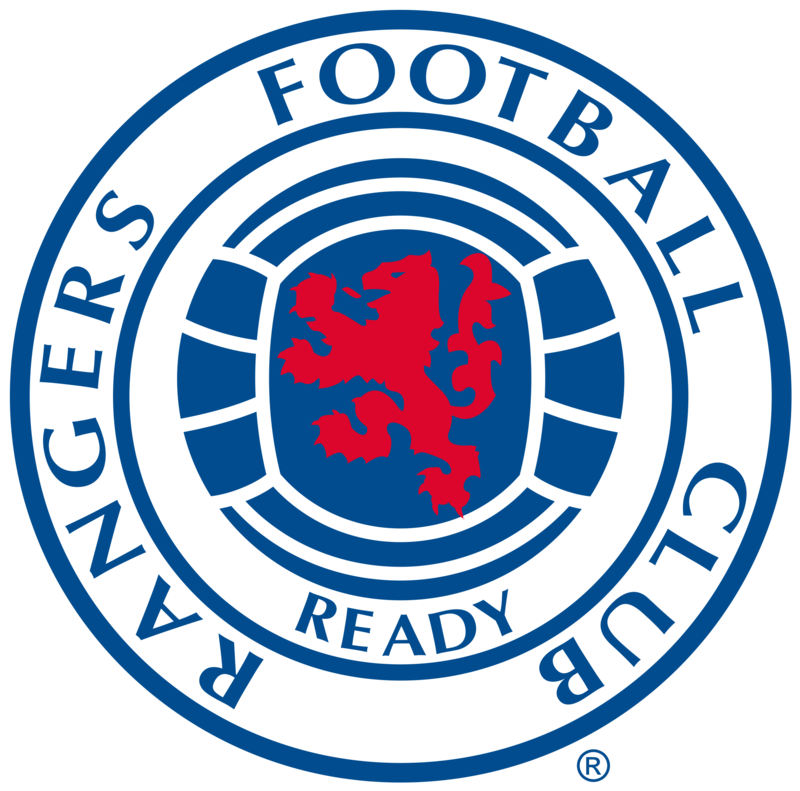 RANGERS: McGregor; Tavernier, Goldson, Worrall, Halliday; Kamara (Coulibaly, 78), Jack, Arfield (Lafferty, 61); Candeias, Defoe, Kent (Davis, 61). SUBS NOT USED: Foderingham, McCrorie, Katic, Barisic. HAMILTON ACCIES: Woods, McGowan, Gordon, Kilgallon, Oakley, Miller, McMillan (Martin, 45), MacKinnon, Andreu, Mimnaugh (Gogic, 45), Sowah. SUBS NOT USED: Marsden, Tshiembe, Winter, Smith, Boyd.